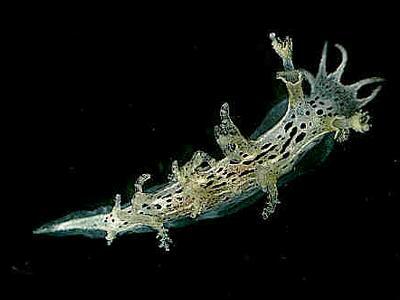 Description: T. manicata is a small nudibranch, with a maximum body length of 13mm. The body is white with dark red, green or black pigment spots on its back. The edges of the mantle bear paired, branched gills, 4 pairs in an 11mm specimen. The rhinophores have sheaths and are branched at the tips. There are 3-4 pairs of long, slender oral tentacles. Habitat: The diet in British waters is unknown, but it is reported as feeding on the alcyonacean Cornularia cornucopiae in the Mediterranean. Distribution: This species is frequent in the Mediterranean and reported from the Atlantic coast of France, but only one or two records exist for the British Isles. The first British record was from Lundy, Bristol Channel, in 1978. Similar Species: Easily distinguished from Tritonia plebeia by the longer oral processes and its distinctive coloration. White body with irregular, elongate, dark spots. Six to eight processes on the oral veil. Picton, B.E. & Morrow, C.C. (2016). Tritonia manicata (Deshayes, 1853). [In] Encyclopedia of Marine Life of Britain and Ireland.